Julia Dye has written stories since her childhood in Milwaukee, and although she writes about everything, she has an affinity for tales with a military flavor. Her father was a bomber pilot during World War II, and she married a Marine. She received a Gold Medal from the Military Writers Society of America. 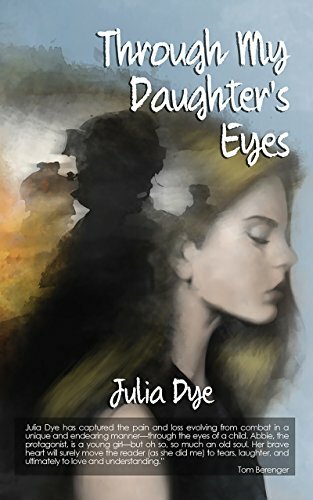 Dye’s new book, Through My Daughter’s Eyes (Warriors Publishing, 191 pp., $14.95, paper; $2.99, Kindle), deals with the courage and sacrifice involved when a military family faces repeated deployments, including new towns and new schools that the children must adapt to. Abbie is a middle school student and is the only child in an Army family. She’s described as “equal parts Flavia de Luce and Harriet the Spy, because she needs to be.” Her goal, and that of her best friend Megan, is to get through Dessau Middle School “by being just good enough to not get noticed but not so good we’d draw attention.” This plan works for a while—and then it doesn’t. The moment when the plan ceases working is the subject of Through My Daughter’s Eyes. Abbie’s father gets deployed again to a combat zone and the stress causes her mother to fall apart, leaving Abbie in charge of things she is not qualified to be in charge of. When Abbie’s father returns, he has changed in many of the usual ways that wars cause men to change. In other words, not for the better. He is not in the mood to talk about what had happened to him. She has her grandpa to talk to, which helps some, but not enough. Abbie has to give up on being the one who saves her family. Grandpa’s talk about the Vietnam War is interesting, especially the part about how Americans were angry at the returning soldiers and how they became an easy target. The novel is well-written in the voice of a child, and held my interest throughout. It is a book for young adults, but has plenty of appeal for adults. I highly recommend it for both adults and young adults. This entry was posted in Childrens, Electronic Book, Fiction, Paperback, Young Adult and tagged Julia Dye novel, Julia Dye Through My Daughter's Eyes, Through My Daughter's Eyes, Young Adult Vietnam war novel by vvaposted. Bookmark the permalink.